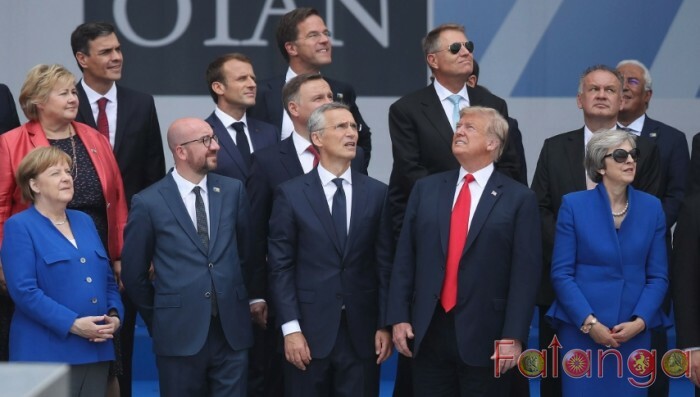 President Donald Trump has traveled to Belgium for the NATO summit in Brussels, as his fellow leaders prepare nervously to greet one of the most antagonistic American presidents in the history of the 69-year-old alliance..
NATO is facing a range of security challenges, including a resurgent Russia, the dawn of global cyber warfare and an ever-present threat of extremist terrorism. The summit is an opportunity to present an updated strategy for the transatlantic alliance and strengthen the international liberal order that has been in place since the end of World War Two. But Trump is unlikely to follow the script. The president is an outspoken critic of the transatlantic pact, established to provide collective security in the face of the Cold War–era Soviet Union. Trump has repeatedly suggested the U.S. is paying too much to protect Europe, and other NATO leaders are fearing more of his public outbursts this week. Military spending will be one of the most significant, and diplomatically sensitive, topics to be addressed in Brussels. NATO countries commit at least 2 percent of gross domestic product (GDP) to military spending each year. But since the collapse of the Soviet Union, only a handful of members have delivered on the pledge. Seven European nations are currently spending more than 2 percent of GDP on defense, according to NATO Secretary General Jens Stoltenberg, up from just three in 2014. Though progress is being made, it will take time for all NATO nations to fall into step. But Trump is demanding immediate results. Before he even arrived at the summit, Trump tweeted, “NATO countries must pay MORE, the United States must pay LESS. Very Unfair!” At a breakfast meeting with Stoltenberg, the president hit upon his favorite talking point once more, calling the spending gap “very unfair,” and warning the U.S. “is not going to put up with it, we can’t put up with it.” The president has even suggested NATO nations should reimburse the U.S. for years of underinvestment. Because the spending commitments relate to each country’s individual military, fellow NATO members do not actually owe the U.S. anything. Regardless, this will be the big issue of the summit for Trump. “That’s going to be the theme repeated throughout multiple engagements, I assume behind closed doors and at any chance the president has to speak publicly,” said Julianne Smith, an associate fellow at the London-based Chatham House think tank and expert on U.S. relations with Europe. Many leaders will simply want to get through the next couple of days without any major embarrassments. NATO will survive Trumpian diplomacy, but NATO’s “ability to lead and put forward fresh ideas is hindered when the U.S. is on the bench, when the U.S. is throwing rocks, and when you have a U.S. that is questioning the utility of the alliance,” Smith explained. The $11 billion project is being run by the state-backed Gazprom gas company and five European countries. It will double Russia’s gas export capability to Germany, reaching around 310 billion square feet per year when it comes online by the end of 2019. The U.S. has opposed the project because of the perceived political implications, as well as its hope to sell more American natural gas to its European allies. Trump told Stoltenberg on Wednesday the Nord Stream pipeline deal “should have never been allowed to have happened.” He claimed, “Ultimately, Germany will have almost 70 percent of their country controlled by Russia with natural gas,” equating natural gas supply to political control. Practical issues of defense will be high on the agenda. There is work to be done on the new NATO commands being set up in the U.S. and in Germany to improve the alliance’s capacity. Between them, the commands could account for as many as 1,000 new staff. Improving readiness in Eastern Europe is one of alliance's most important projects. NATO began expanding its forces in the Baltic states following Russia’s invasion of Ukraine in 2014, deploying four multinational battalion-size battlegroups in Estonia, Latvia, Lithuania and Poland on a rotational basis. In the event of a war with Russia, this is where the tip of the Kremlin’s spear would most likely attack. These units have been involved in large-scale exercises over the past couple of years, and further cooperation and additional deployments will be under discussion in Brussels. Secretary of Defense Jim Mattis will also be keen to push forward his “30-30-30-30” plan, which will establish the readiness of 30 land battalions, 30 air fighter squadrons and 30 ships ready to deploy within 30 days of being put on alert. In May, Poland’s government proposed a plan to bring more U.S. troops to the country, and even offered to pay $2 billion for the privilege. The government suggested setting up a joint armored division with 15,000 American troops and as many as 250 tanks and armored vehicles. This would be a significant challenge to Russia, which said such a step would raise the risk of war in Eastern Europe. NATO’s defensive line stretches all the way to Scandinavia. The U.S. Marines recently announced that additional troops would be sent to Norway to bolster the Marines’ rapid defense forces there. Swedenand Finland have also been taking additional security steps given their proximity to Russia's borders, though neither are full members of NATO. Further afield, representatives will be working on NATO's commitment to send hundreds of people to assist in training missions in Iraq. Though mostly working in noncombat missions, this is still a significant step. NATO expansion is always an important topic, not least because of the diplomatic waves such moves create. Russia sees each new NATO admission as a security threat, especially if new members are close by. In 2016, the small Balkan state of Montenegro became the alliance’s 29th member. But as NATO grows, Russia will fight tooth and nail to stop it. Indeed, it has emerged in recent months that Russian agents may have been involved in a failed coup in Montenegro the same year the country joined NATO. Last month, Colombia became the only Latin American country to join NATO as a “global partner,” meaning it will be fully accredited to Brussels but does not necessarily have to take part in military action. Global partners can cooperate with NATO on a range of defensive and security issues, and other nations with this status include Afghanistan, Australia, Iraq, Japan, the Republic of Korea, Mongolia, New Zealand and Pakistan. Though not full members, the involvement of these countries shows NATO’s global influence, which continues to unsettle Russia.